I vaguely remember-ed it from some-where, and got some from my friendly Healthfood Store. WORKED LIKE A MILLION BUCKS!!! They recommended using a cotton swab or toothpick... I tried the latter, and didn't like it. I simply put about a drop on my finger, and rubbed it in on one side of the tooth-especially along the gum line. I then got another drop and did the same thing on the other side. Absolute relief for three to four hours-even if you drink water or cola. About 1/2 the time, if I ate something I had to reapply it. Use it SPARINGLY-it's very strong!!! Don't worry about putting more on, or reapplying. in this kind of minuscule quantities, it's OK.
Do worry about put-ting too much on at once... it'll burn your lip and tongue. I managed to burn mine several times at first, but I don't mean it LITERALLY-rather, it just feels like it briefly. I hope I am not sounding overcau-tious. It is easy to apply, and it is simply a spice that deadens-briefly- nerves. FLASH!!! Rusty is employed!!! Instead of website design which we expected, he decided what he wanted to do was write (this is the son with the Major in English and Minor in Journalism. He starts TUES JAN 28th, 2003; working as a staff writer for Neighbor Newspapers. He will be filling in at the Dekalb Neighbor for a week or two (they lost 2 writers last week) and then will move to The Northside Neighbor based in Sandy Springs. He should be doing 3 of his own, and 3 assignments once he gets to Northside. What he'll do for Dekalb, we'll just have to wait and see. 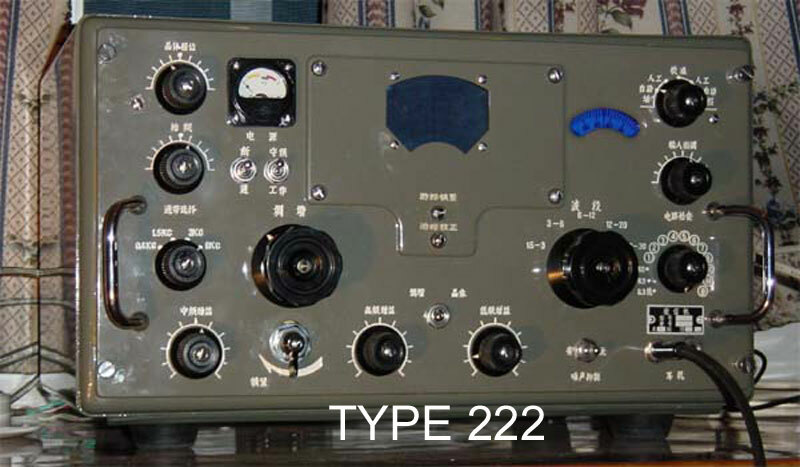 I have sent my R-390 to China!!! 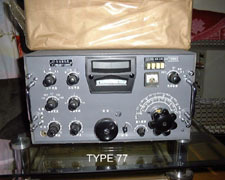 I traded it for a Chinese (Army) Type 77 HF Receiver. 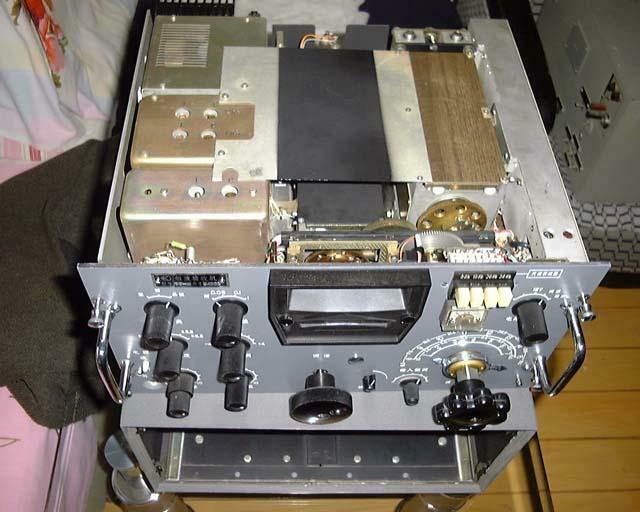 Note I mean my R-390-NON-A... NOT my Chuck Rippel-rebuilt R-390-A. What an interesting adventure this has been. I had seen emails soliciting R-390s for a couple of years... and finally decided to take the plunge with my R-390. 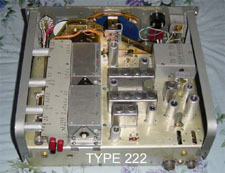 It was only possible because the R-390 is a modular-plug-in receiver. If you take enough of 'em out, you can just get it through the weight restriction of 44 lbs / 20 kg. There is a girth restriction of 72 inches. That means that the height, plus the width plus the depth of the box must not exceed 72 inches (~183 cm). That leaves ~ an inch (2.5cm) all around the R-390. Not very much!!! ...and oh yes: Chinese regulations state NO WOOD. But the packing store guy is a friend, and though he groaned a lot, he really came through for me! He first built a double-walled cardboard box around the unit. Then he built double-thick top and bottom pieces that left about 5 inches (~13 cm). Taping the top and bottom pieces made for a very secure package-or rather, a package as secure as it could be with these restraints. It was easy to pick up-considering its weight. So now, on to the post office. I had several packages, and had to make more than one trip from the car. Hoisting the big box onto the postal counter, and telling them it was for the Peoples' Republic of China got some *** very *** raised eyebrows!!! I had been told there were two important points about the Customs form: 1) the total value had to be no more than 90 yuan (~$85); and, 2) the description of the item(s) My friend suggested was: "old radio for collector". I followed this... but added: "(1955)". I didn't want some potential thief anywhere throughout the passage to think it might have been an Atwater-Kent!!! 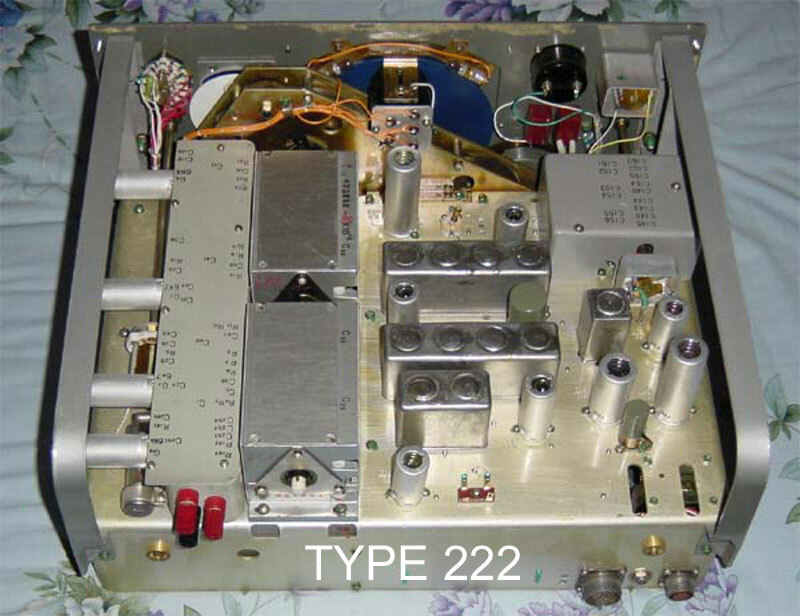 CHOICES: I could have-in exchange for the R-390-either a "NOS (New-Old-Stock)/ NIB (New-In-Box) w/ spares" Type 222 tube receiver; or a similarly NOS/NIB Type 77 solid-state receiver. My friend has both for trades. I gave this a lot of thought. I had photos of both receivers (see below). I was leaning towards the Type 77. If there were any tubes in the Type 222 that didn't have European/American pin-for-pin equivalents, and something failed, once the "spares" were gone, you were just plain out-of-luck. On the other hand, you can manage to replace *** any *** transistor. The final decision was made by my friend in China. I asked him which he thought was the better receiver, and he said that-although it was uglier-the Type 77 was much better. Well... that did it for me. NOTE: The R-390 got to my friend in China without a hitch. I am working on getting a couple of 120VAC/220VAC autotransformers paralled to power the unit, since AC power is easier than providing both +12VDC and - 6VDC. 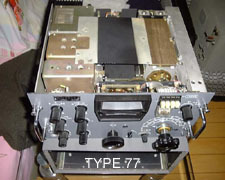 See the receiver's webpage from time-to-time for photos and progress reports. Anyway, I couldn't find the problem at first, and-after recovering that ~75% and quickly burning a CD with the taxes, and the old outlook.pst- I quickly tried to contact the several ebay purchases and free parts/schematics I had obligations for. Got several of 'em. Didn't print them however. BIG MISTAKE. Both drives checked good using WIN 2000 Pro's tools (primarily the old 'reliable': CHKDISK.) I bought a new ASUS motherboard, thinking that it was a chip-level failure. After a lengthy call to ASUS (they denied anything was wrong-but could not tell me a thing to do to correct it) I finally took the whole unit to my motherboard dealer, and it promptly allowed WIN 98 to install. Ergo, the built-in RAID on the replacement ASUS was the cause of 3 weeks of agony-trying various PIO & UDMA parameters in an effort to get WIN 2000 Pro to install. I swapped the ASUS for an ABIT, and the system was up and running within the hour. It wasn't cheap, but the new system is really neat: a 1.4 GHz AMD K7 Thunderbird; 768 MB of 133 MHz RAM; ~ 106 GB of ATA-100 HDD; NVIDIA GeForce 2 GTS w/32MB video RAM; and a PC Power & Cooling 350W PS. There is a Chinese curse: "May you live in interesting times!" Well... things got a little too interesting with all this! Although I knew the warranty was 5 years, I didn't have my receipt for the Deskstar. Because of that, I poked around about checking to see if there was ANYTHING to be done-warranty-wise. I finally checked the other day. Just typed WWW.IBM.COM and then 3 or 4 stages to warranties or something like that. They asked ONLY for my model number and serial number-both right there on the hard drive's label. There was some information to enter (obvious stuff like my name and address-and what checks I had performed in determining the drive was bad) but nothing about date purchased, or from whom. In no time at all an RMA number was supplied, and packing instructions and an address were provided. (No 'peanuts' and no bubblewrap-only high-density foam.) A new drive will take approximately 2 weeks after they receive the drive. I cannot say enough good things about the way IBM warranties their Hard drives!!! What's a Grid Dip Meter (or: GDO)??? What's a Grid Dip Meter? Check my GDO Collection page for photos and short write-ups of what I believe is one of the better collections anywhere of this useful electronic instrument! 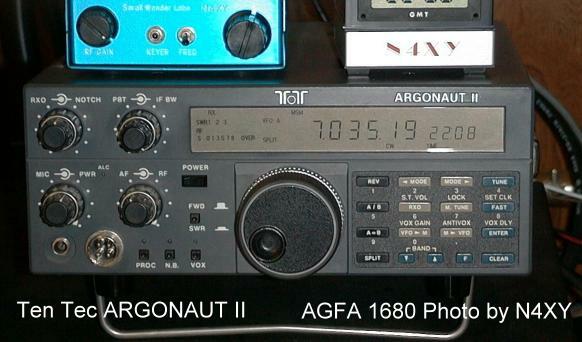 I got a call recently about my Argonaut II that I had sold to a friend several years ago. I don't sell much, preferring to pick carefully, and hang onto-and use-my equipment. This particular deal was one I have always regretted... so when I got the call that he had decided to part with it, I was thrilled. 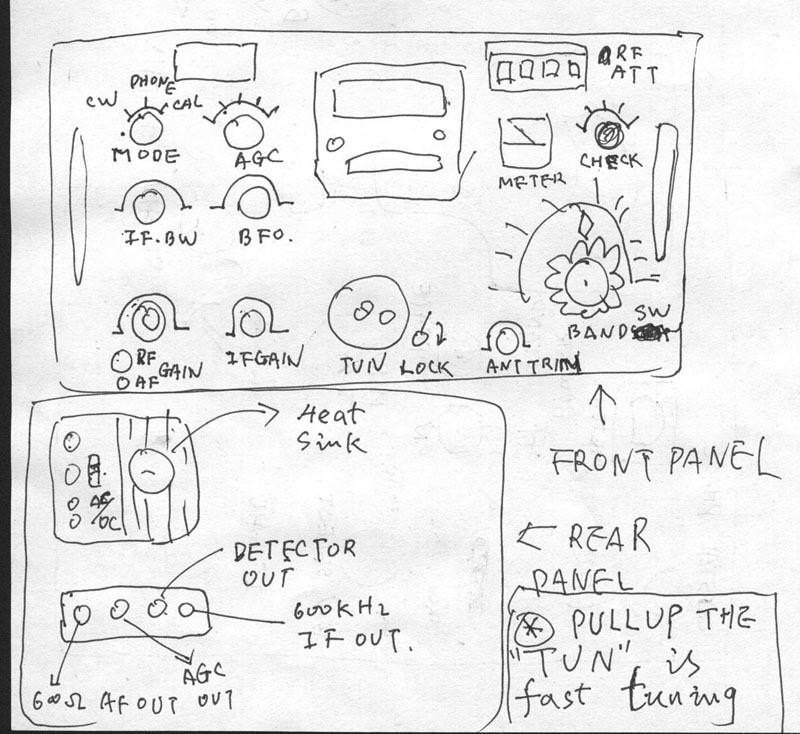 I loved that rig a lot, and it has always been-to me-the best QRP rig period. I think the K2 has a better receiver, but otherwise, the Argonaut II remains my favorite-or a partner with my K2. Whatever... 1st/2nd place/etc. I am really looking forward to putting it back on the air! I'm not REAL sure just where I heard of Carlos Mayer's Printing in Argentina; but I went to his website, and went through his samples; and decided he was THE guy to do the color-photo QSL I have had in mind for years! I cannot recommend Carlos highly enough-but I don't have to: his QSL samples are like a travelogue of Argentina. Go look at them, and if 1st class QSLs are what you are looking for, you'll know he can do them for you. I then Express-Mail'ed the two negatives (yes: USPS has International Express mail-uses the very same Express mail form, and costs about $20 for 2-3 day delivery) and the next thing you know, he emailed the low-rez sample I'm displaying here. I took both pictures years ago-and they remain two of the best macros I ever took. Note the bee's red tongue! 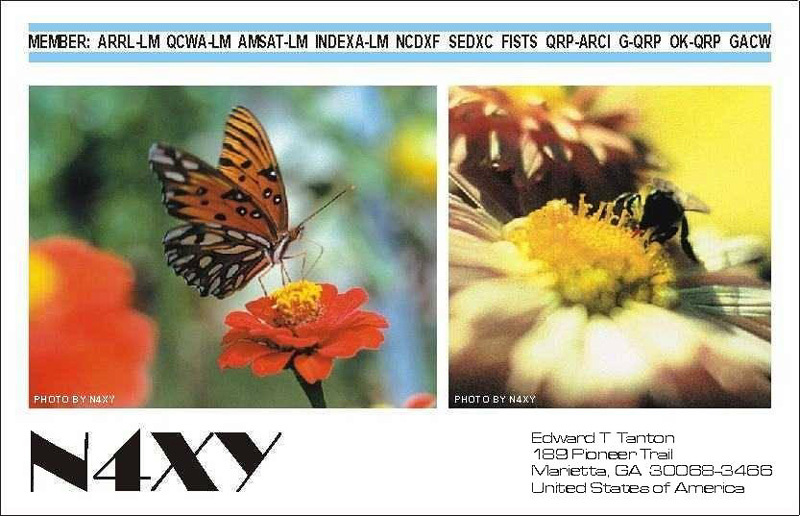 Click on the QSL thumbnail for a full-size-but still low resolution-version. I have the honour of being invited for membership in the Argentine CW Activity Group: GACW. They are a very active group of mostly Argentine hams interested in furthering the CW mode and doing DX-Peditions to the many Argentine possessions and territories. Their webpage may be found at GACW. A very nice bunch of guys too. My membership NR is 482.